The book was purportedly signed at a campaign rally in 2016. A Bible said to have been signed by Donald Trump sold on eBay recently for $325, according to the listing. Rick Harrison, owner of World Famous Gold & Silver Pawn Shop — a Las Vegas retailer featured on History Channel's "Pawn Stars" — said through his representative that a similar item could fetch even more if it had key paperwork. Harrison said that Trump's signature was a hot seller and that a Bible with a certified signature and sold through a top auction house could bring as much as $4,000. Harrison cautioned, however, that not all online sellers were trustworthy. NBC News contacted the Bible's seller as well as eBay but neither responded. 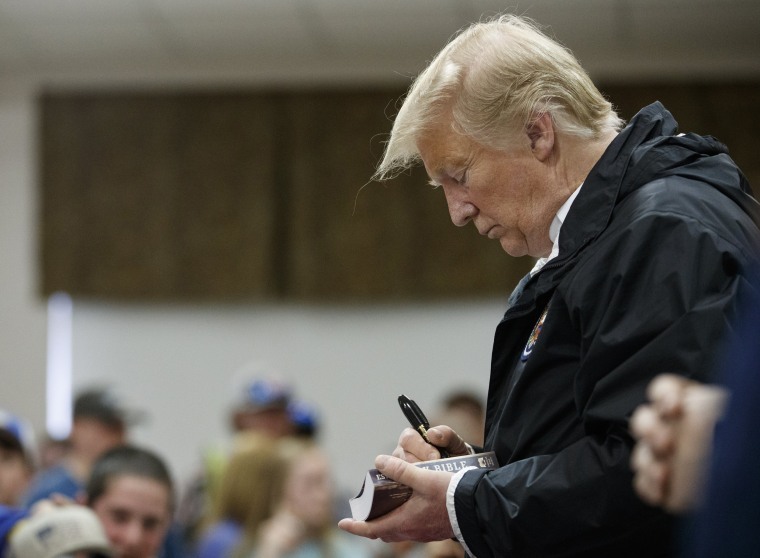 Last week, Trump was seen signing Bibles at Providence Baptist Church in Opelika, Alabama, while he was touring the temporary relief center after a series of deadly tornadoes. The president posed for a photo with one Bible's owner, a fifth-grader, and he signed other items, including shirts, hats and cellphones.